In Feb, 1988 Joe Biden had a brain aneurysm: did we see its lingering effect during the debate? By On February 12, 1988 Joe Biden underwent surgery to repair an aneurysm had done to his brain. Blood was leaking in his brain and it required an immediate operation. His condition was so serious that he received Last Rites from a Catholic priest. May 4, 1988 he underwent second surgery to continue the process of putting his brain back into working order. Based on his performance in last weeks Vice Presidential debate these procedures may not have been entirely successful. Full recovery from any kind of a medical episode involving a brain aneurysm is never a sure thing. Recovery to normal is subjective. Those who regain their physical strength and coordination can perform manual labor and might never seem the worse for the episode. Those whose occupations require mental dexterity might not be so lucky. Nevertheless, because the brain is such a complex organ the ill effects of an aneurysm might not show up immediately they might show up gradually over the remaining the rest of the victims life. When a victim has had such an episode there is always the possibility of the sufferer falling prey to Pseudobulbar affect (PBA), which results in emotional lability or swings in emotions that can result involuntary crying, involuntary laughing or both. Biden did.. Those who suffer from PBA may display incongruent emotional responses. When frustrated or angry they can laugh uncontrollably. his way to try to explain away his bizarre.. This is a serious matter, but watch the media and the Democrats ignore it as they have for all these years. Jesse Jackson, Jr. has been diagnosed with bipolar disorder, which means that he has experienced a psychotic break (manic episode). Where are the calls for him to resign? Is it appropriate to have a psychotic person in a position of power? I thought he was just an idiot. Maybe he comes by it honestly. I’m sure if one looks hard enough, it will be found. While it doesn’t happen all the time, people who have brain aneurysms can lose the ability to stop themselves from saying inappropriate things. After my grandmother had an aneurysm, she would get real nasty with people (before that, she wasn’t the most pleasant person in the world but afterward, she got really nasty). I have psychologically tested many brain injured patients - my opinion is anyone who has had two surgeries for brain aneurysm, should never be Vice-President. Psychosis, deeply flawed character, evil disposition nor criminal or asociological backgrounds are a plus for a Democrat. No, that behavior can’t be blamed on an illness or condition. Biden behaved that way because he is a boorish jerk, plain and simple. He has a brain? Who knew? I still think Biden was drunk. I think it’s likely Joe’s laugh lobe was left affected. Biden appears tempermentally unsuited for the office. He needs a thorough medical exam and the results of that exam needs to be made public. This is a serious issue that goes beyond electoral politics. 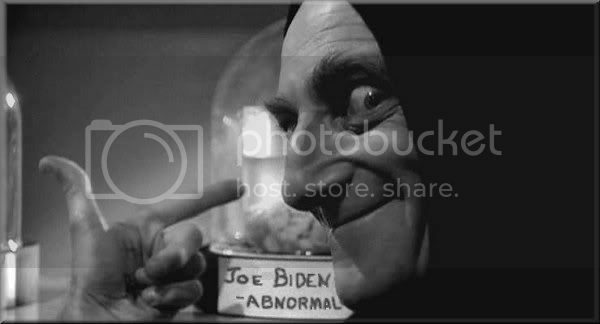 Dont voters have a right to know whether Biden is ill or merely unlikeable, impulsive and prone to deceitfulness? SAN DIEGO, October 10, 2012  In January, 1988, Vice President Joe Biden, then Senator from Delaware, was diagnosed with two brain aneurysms. In February, 1988, he underwent surgery to repair one of the weakened/ballooning arteries on one side of his brain. Shortly thereafter, he suffered a blood clot in his lungs known as a pulmonary embolus, which required timely, life-saving hospitalization and treatment. In August, 1988, the second damaged artery on the other side of the Vice Presidents brain was surgically mended in a 270 minute operative procedure under general anesthesia. People with a history of blood clots, brain surgery and/or brain aneurysms are at a significantly increased risk of stroke (a laymans term to denote a lack of blood flow and oxygen to brain tissue due to a clot-induced vessel blockage or outright vessel rupture and bleeding). The Vice President, today, remains at an increased risk for stroke. The Dems probably support Biden 1000% just like McGovern supported Eagleton 1000% back in 1972. We remember how that went! As my dad aged, the patrimonial curse of his family manifested itself within his brain. As he began to have seizures and TIA's, his personality changed. Once sweet and kind, he developed a dark side that would lie to your face and scheme to achieve his goals. This was not the dad I grew up with; as time marched on, he became less and less like the person I knew. From my experience, Joe Biden's behavior exhibited some of the negative traits of my dad's malaise and if I'm correct, we don't need someone with that potential to have access to the football. If Joe Biden had a brain operation, it would be exploratory surgery. Folks would be surprised to know how many senior Senators with metal plates and brainstents in and on their skulls made and make decisions that affect all of us. just sayin’. I’m familiar with PBA as I have a neurological disease. Biden didn’t display PBA symptoms because with PBA you can’t turn it on and turn it off. If it had been a true PBA attack, he would have been laughing through his own responses and not able to answer a question, not just turning on the smirking and jeering everytime Ryan spoke.